The Florida Agriculturist issue published on November 9, 1887. The Florida Agriculturist began publication in 1878 with Christopher O. Codrington as its first editor. Codrington, who was from Jamaica, was an importer of exotic plants. The newspaper was published weekly through 1907, but changed to a monthly paper in 1908. The paper changed hands from Codrington to E. O. Painter by 1887. Painter had so much success with the paper that he was able to create a printing company: E. O. Painter Printing Company. The paper was directed towards the farmers and fruit and vegetable growers of Florida. The Florida Agriculturist discussed different places in Florida, especially DeLand and Jacksonville, that were the best to plant, and which fruits and plants were in season. The paper also offered railroad schedules. In the late 1800s, with a large influx of Chinese immigrants, the newspaper recommended these immigrants as farm laborers, for the purpose of replacing African-American laborers. In 1907, Painter sold the newspaper and it relocated to Jacksonville where it would last another four years eventually ending publication in 1911. 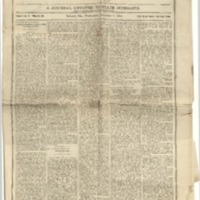 Some of the topics discussed in this issue include an industrial cooperation, artificial fertilizers, the Florida Shippers Union, Roger LaRoque, the Haymarket Affair, packing for the poultry industry, the fate of anarchists for the Haymarket Affair, the role of women in the home, malaria and various other medical ailments, the use of cottonseed as fertilizer, broadcast harrowing,new city ordinanaces for DeLand, and the Seventh Judicial Circuit Court of Florida. Original 8-page newspaper issue: The Florida Agriculturist, Vol. 10, No. 27, November 9, 1887: Maitland Public Library, Maitland, Florida. Digital reproduction of original 8-page newspaper issue: The Florida Agriculturist, Vol. 10, No. 27, November 9, 1887. DeLand Collection, Volusia County Collection, RICHES of Central Florida. Originally published by The Florida Agriculturist. "About The Florida agriculturist. (DeLand, Fla.) 1878-1911." Chronicling America, Library of Congress. Accessed June 15, 2016. http://chroniclingamerica.loc.gov/lccn/sn96027724/. “The Florida Agriculturist, Vol. 10, No. 27, November 9, 1887.” RICHES of Central Florida accessed April 23, 2019, https://richesmi.cah.ucf.edu/omeka/items/show/7583.